How come women are only 19% of Congress when they’re over half of the United States population? Everyday in the United States, women fight for equal representation in academia, the workplace, and most importantly in our country’s politics. Even though women make up an almost exact 50% of the United States, in 2016 women remained less than a quarter of elected the leaders in all levels of office (A Closer Look). This stems from women being highly less likely to seek political candidacy in this country. This is what experts identify as the largest barrier that exists and persists to keep our women out of office. There is hope in this situation. Women are repeatedly shown to win against male counterparts once they get in the race. These facts stay relevant across all parties. When you do look closer to the role that parties do play in election, you see that there are some large differences for women. The majority of postgraduate women are in the Democratic party (Smith). This means that success of women is closely tied to when the Democratic party is successful. This can be partially good for female representation when Democratic nominees are winning election, but at the same time can hold a lot of women out of office if the Republican party has more influence than the Democrats. Regardless of if a woman identifies as a Republican, Democrat, or other, a functional democracy is supposed to be a representation of the will of its people. Without women in office to represent for the hundreds of millions of women in our country, we will never get to a point where our government accurately reflects its people goals and priorities. The reason why I want to dive deeply into this topic specifically is because of my own passion for politics and the fight for women’s equality. I think by choosing this topic, I can engage in two areas that I am very motivated to learn more about. I also believe that solving this problem and putting more women into American politics will, in turn, solve a few of the numerous injustices that women are faced with in this society. I have also grown up with and around several strong women who make me want to get to the bottom of this national dilemma that our country is faced. I also think that solving this problem will make our country a better place to live, for men and women alike if we do increase gender diversity in our politics. This first step in the right direction will give women a voice in politics that can not be ignored, and finally, begin to prioritize the needs of the hundreds of millions of women that live in the United States. Moving back towards our historical theme of this modern day problem is the 19th century Women’s Rights Movement. 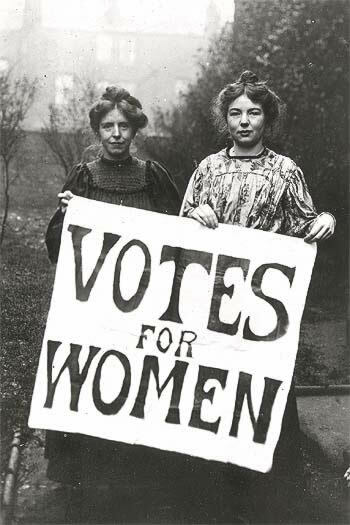 The earliest manifestation of the movement began with the Women’s Suffrage Movement in the mid-1800’s. Though historically there have been disagreements internally on the means of the suffrage movement, the movement’s common goals consistently pointed towards female political enfranchisement. In 1848, the United States saw the movement’s first organized congregation during a convention in Seneca Falls, New York. Held by Elizabeth Cady Stanton and Lucretia Mott, the convention produced a “Declaration of Sentiments, Grievances, and Resolutions” which mimicked the formatting of the Declaration of Independence, and outlined the very first goals set forth by the suffrage movement (The Women’s Rights Movement, 1848–1920 | US House of Representatives: History, Art & Archives). In the Declaration, Stanton sets forth these resolutions to demand, “that woman is man’s equal—[and] was intended to be so by the Creator”(Declaration of Sentiments and Resolutions). This is the first time in American history that we finally see an organized pushback from the prior biblical conception of women, and is one of the most important steps in the fight for Women’s equality. The Seneca Falls Convention also helped the Women’s Rights Movement gain legitimacy, and finally put the issue of equal gender rights in America, in the spotlight. Following the Civil War, we saw a major split in the Women’s Suffrage Movement. To avoid being marginalized, the movement began to move strictly towards giving women the right to vote. This is where we see a large splitting in the suffragists who were fighting for female voting rights. A large chunk of suffragists saw that the only way to make a significant change in the United States’ legislation was to earn the right to vote directly through the federal government. By giving women the right to vote through an amendment, people reasoned that it would not allow conservative states the wiggle room to deny females from voting. The push for reform at the federal was led by Susan B. Anthony in the National Women’s Suffrage Movement (Lewis). A different strategy that was also fighting for the same female voting rights, was creating federal reform at the state level. Spearheaded by Lucy Stone was the American Woman’s Suffrage Association, which valued gradual legal progress taking place state by state higher than the all or nothing bargain being pushed by the NWSA (The Women’s Rights Movement…). This strategy would give voting rights to women in states that would agree to it, in the hopes that the state legalization would spread to other states until it could eventually have the ¾ state support needed to pass a voting rights amendment. Even though the NWSA and AWSA had polar opposite strategies on how to legalize female voting rights, both organizations were marching to same tune as members of the Seneca Falls Convention in the fight female political representation. Following the Civil War in the 1860s, we really begin to see the mobilation of these suffragists in US politics during this chapter of the Women’s Suffrage Movement. We also see one of the largest changes of the American Women’s Rights Movement, in its history. Most importantly we start to see legal progress in the fight for Women’s suffrage. During the 1890s, the Women’s Suffrage Movement experienced a new serge. The two previously separate organization of the NWSA and AWSA, in order to expand their collective influence, the two combined to create a new organization call the National American Women’s Suffrage Association (NAWSA). This move worked wonders for growing and legitimizing the suffrage movement as a whole. The NAWSA began to draw in support from across country including, the Women’s Trade Union League, the Woman’s Christian Temperance Union, and the National Consumers League (The Women’s Rights Movement…). The suffrage movement gained traction like it never had before by connecting with these other movements. This led American women to finally break further through the political glass ceiling by gaining full voting rights in Colorado (1893), Utah (1896), and Idaho (1896) (National Geographic). This was a complete turnaround after the movement began to die down during the 1880s. The merging of the two organization breathed new life into the now newly fired up civil rights activists across the country. This was a massively important step for the 19th century Women’s Rights Movement, because of how it revitalized activists to fight for Women’s Suffrage and legitimized the movement in the eyes of the American government through their partnerships with other civil organizations and successes at state level legislation. This final chapter of the 19th century also moves us one step closer to the problem we are facing in American politics today. I have come up with two potential ways that we can increase gender diversity in American. First, is by taking a very developmental approach to the situation, by increasing gradually expectations on women to run and take command in there local and national politics. This relies on the fact that women are slowly coming into office already and that it is only a matter of time before men and women are equal represented. I think that this is a long-term strategy that can erase the stigmatism around women in politics gradually. This can be effective, but in my opinion may be too hands off. My other and much more radical solution that I also propose is that we make congress pass an amendment to make the elected United States senators one male and one female, as well as the house state representatives to not only have their seats based on population, but also to have them be based on gender population. This is a far more radical strategy to attack this situation but in my opinion, will only speed up and move America to its end goal of having men and women equally represented in politics. These two approaches are not mutually exclusive and I think that they each have their own advantages. While a hands-on approach may be an answer to some, there is always a spectrum when it comes to people’s political views. Nevertheless, we need to take a diverse approach to an issue as complex as this one, and thankfully our country is moving in the right direction. “Declaration of Sentiments and Resolutions.” Declaration of Sentiments and Resolutions, Seneca Falls: Stanton and Anthony Papers Online, ecssba.rutgers.edu/docs/seneca.html. Lewis, Jone Johnson. “National Woman Suffrage Association.” ThoughtCo, www.thoughtco.com/national-woman-suffrage-association-3530492. Smith, Samantha. “A Deep Dive Into Party Affiliation.” Pew Research Center for the People and the Press, 7 Apr. Society, National Geographic. “Woman Suffrage.” National Geographic Society, 15 Oct. 2012, www.nationalgeographic.org/news/woman-suffrage/. “The Women’s Rights Movement, 1848–1920 | US House of Representatives: History, Art & Archives.” The Women’s Rights Movement, 1848-1920 | US House of Representatives: History, Art & Archives, history.house.gov/Exhibitions-and-Publications/WIC/Historical-Essays/No-Lady/Womens-Rights/.